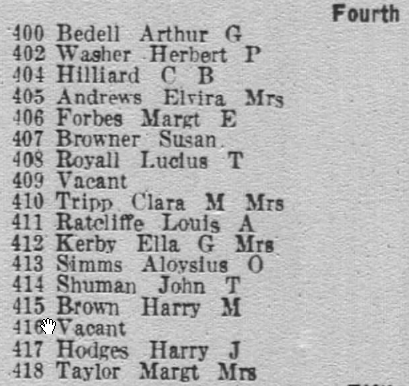 “Street and Avenue Guide,” Boyd’s Directory (1940). William P. Thomas (laborer); Julia Lee (cook). Theodore J. 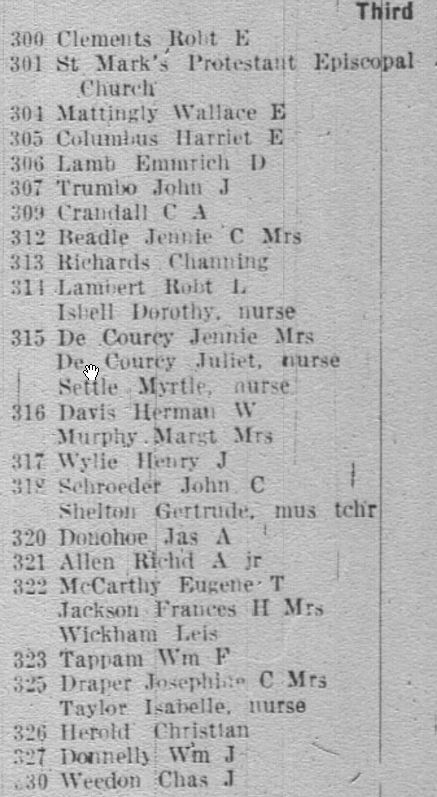 Van Doren (tailor); Bernard J. Vandoren [sic] (clerk). Harmon M. Brush (clerk, Interior Department); Isabel Gray (servant). 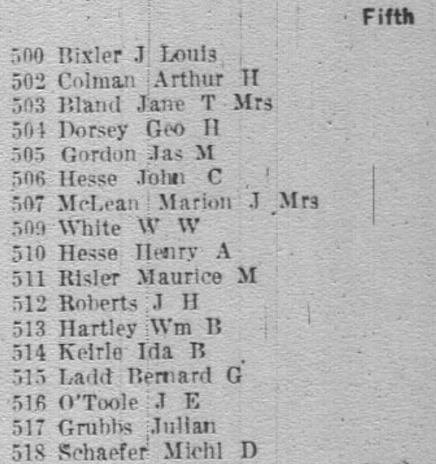 Harmon M. Brush (clerk); Isabel Gray (servant). 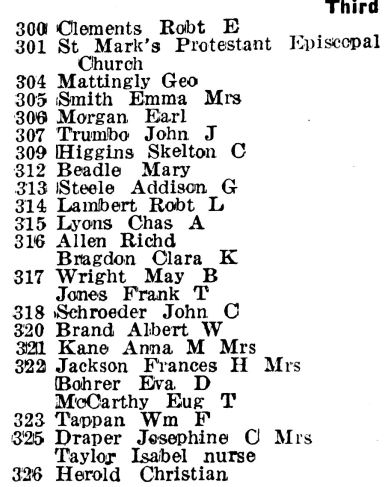 Edward Horn (cabinetmaker); Ida Horn (dressmaker). 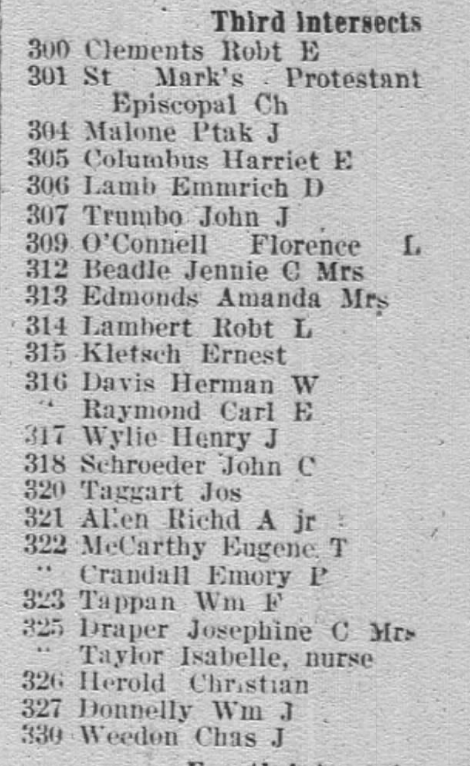 Emma Bumpus (Government Printing Office); Lorenzo D. Bumpus (Capitol Police). 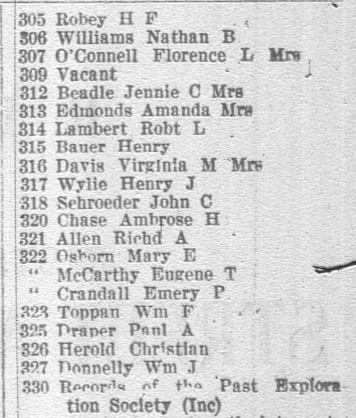 Emma C. Bumpus (laborer); Frank M. Bumpus (messenger); Lorenzo D. Bumpus (police). L. D. Bumpus (Capitol Police). Charles F. Fletcher (Government Printing Office). Herbert Kreisher (conductor); Robert H. Leight (conductor). Christian Herold (machinist, Navy Yard). Lucien H. Mercier (clerk, Senate Office Building). 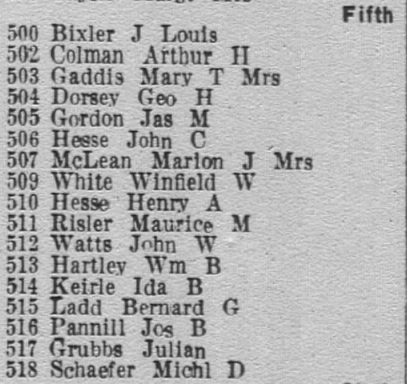 “Street and Avenue Guide,” Boyd’s Directory (1934). 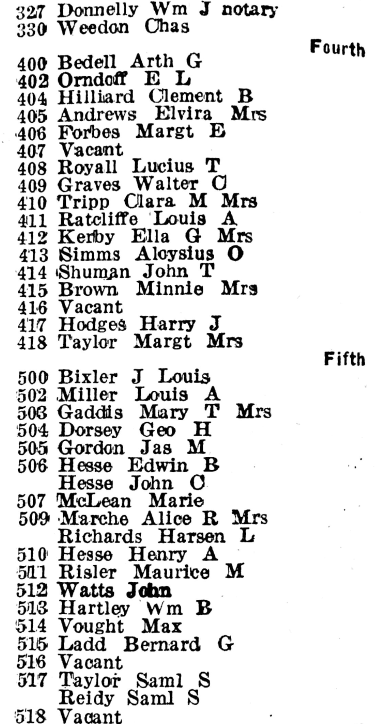 “Street and Avenue Guide,” Boyd’s Directory (1936). 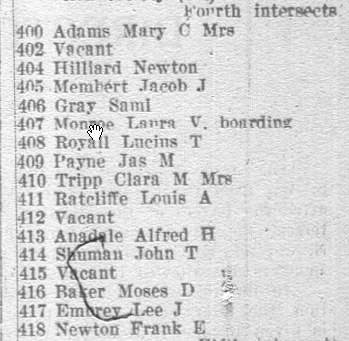 “Street and Avenue Guide,” Boyd’s Directory (1932). 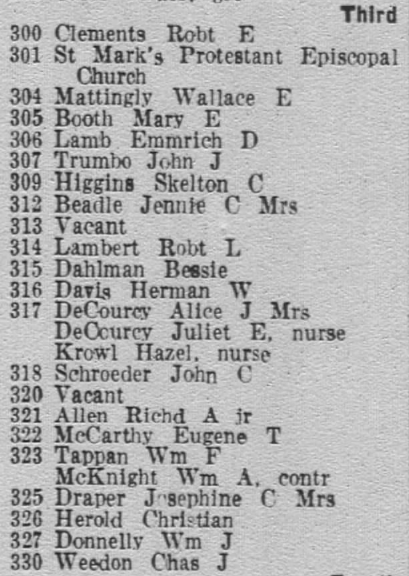 Street and Avenue Guide, Boyd’s Directory (1923). 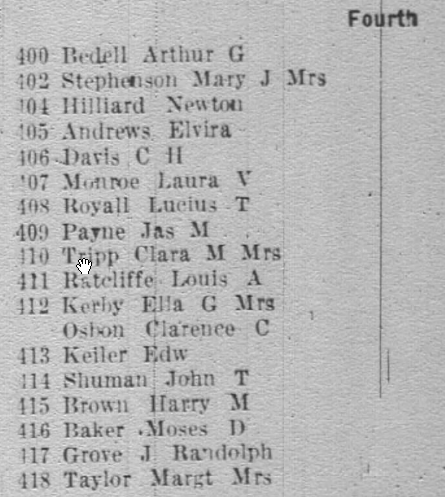 Street and Avenue Guide, Boyd’s Directory (1914), p. 1434. 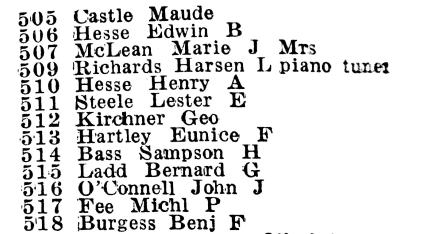 Street and Avenue Guide, Boyd’s Directory (1917), p. 1332. 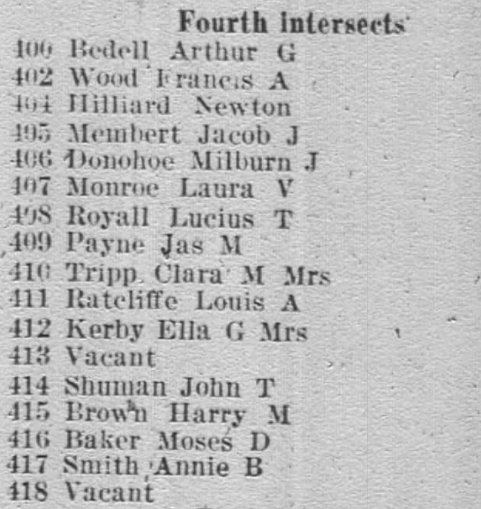 Street and Avenue Guide, Boyd’s Directory (1923), p. 1706. 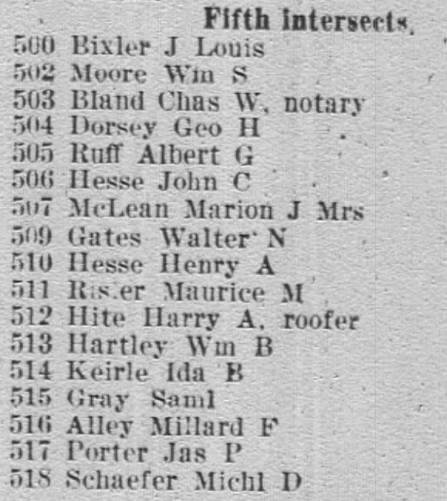 Street and Avenue Guide, Boyd’s Directory (1920), p. 1590. 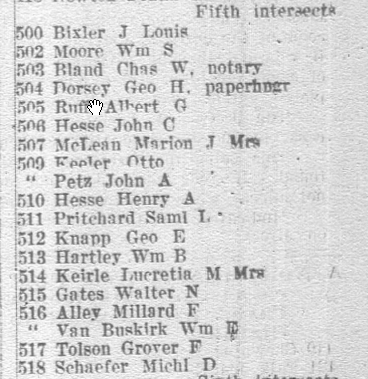 “Licensed to Marry.” Washington Post, 20 March 1936, p. 30.